Move the icons for Mail, Calendar, Contacts etc to the top, or allow me to choose where they are positioned. Need ASAP! : Sync integration with iCal. Conversation management: Oulook's navigation pane gets confused and multiple conversations take on new titles when deleting (bug). The navigation pane is not doing an effective job of keeping track of conversations. Faster, more effective search. Did I mention it was faster? So far, aside from the unfamiliarity of the interface, I'm not impressed at all with the new Outlook for Mac 2011 (apart from the fact that it doesn't crash every time I try to read an HTML email). Email is a necessary and essential part of my business, and a solid software tool is mandatory. After an unsuccessful first attempt to import my Entourage 2008 data (corrupt database, needed repaired. Microsoft could improve the user experience by doing a database integrity check prior to importing from Entourage 2008), the second import was successful, or so it seemed. With this first install, the day separators in the mail list column did not appear. Only after uninstalling and reinstalling did they appear. After the Microsoft updater installed a 110MB update, I checked the empty install of Outlook and My Day appears. So if you're content with starting from scratch with a blank install of Outlook, you're all set. The rest of us are probably upgrading, and since you can't Can't sync Outlook 2011 and iCal without dragging and dropping from Outlook to iCal, then it's not an option. Junk mail folder buried at bottom of interface and not easy to access if you have a long list of folders. Defaults to hidden preview pane. Not compatible with the upgraded me.com. C'mon, why can't sync services work with any of the Mac OS and Mac software seamlessly? If you quit the app, it marks all emails read. Unread emails aren't readily distinguishable from the read ones. Heard of bold? Why can't I change the list font to my preference of typeface, and size? As with Microsoft's browsers, the developers seem to think that "Small, medium and large" are options that should apply to CSS, type size and interface design. Small, medium and large are clothing and beverage sizes, not for interface design. Preview panes disappear even after being set to display in the Junk Mail and other folders. Confused? So was I, until I investigated further. My recommendation is to buy the 1 Pack, which allows installation on a single computer. The difference: 1 Pack: 1 User, 1 Mac. 2 Pack: 1 User, 2 Macs. (so if you want to install the copy on your laptop and desktop, you need the 2 Pack. This marks a change in Microsoft licensing. The price difference is generally $100, so consider carefully what license you buy. Overall user experience: 5/10. Keep trying Microsoft, someday you'll get it right. Export your contacts in case this process does not import or update them successfully. Copy the Contacts, Events, Folders, Mail Accounts, Message Attachments, Message Sources, Messages, Note and Signatures folders into the new identity's Data Records folder. Rebuild the new identity database. Check to see if My Day window appears. Mine did. Note: I had to manually import my contacts, from VCF files. I resigned myself to having to recreate my rules and signatures... often they get corrupted, and after a couple of hours of trying to figure out which folders may be causing this problem, narrowed it down to Rules and the UID folder, although another may be the culprit. At any rate, highly annoying. How many productivity hours are lost worldwide due to Microsoft software bugs? 12/6/10: the saga continues. While My Day appeared with the rebuilt database, Send/Receive no longer worked. I have reverted to my original imported data files for the time being. 12/8/10: one more try: First I deleted and recreated all of my Mail Accounts, then followed the procedure above. Success! My Day is visible and Send/Receive email works. Contacting Tech Support is an option (1 year of tech support!) according to the box. Until you actually try to contact them, and are lead down a rabbit hole of screens until you reach the end, where the final screen says it's going to cost $295.00. Why can't Microsoft make the user's experience pleasant, and not hide behind screens and obfuscation for tech support for software that they know contains bugs when they release it? I'm not one for nostalgia, but reflection is healthy and valuable so that we can evaluate where we've been and where we're going. It's no different with Sooy+Co – celebrating and observing in 2010 – 15 years of business, all of which we are extremely grateful for. Business ownership and entrepreneurship weren't a consideration when I graduated from Bowling Green State University in 1984 (the year that the Macintosh was announced to the world). I suppose it was inevitable – my father is one of the most entrepreneurial individuals that I know – and the DNA of entrepreneurship was part of our family from the start. I often say that entrepreneurship can't be taught, it's a way of thinking, but it is possible to teach people how to think differently. When we think differently, it's transformational – and transformation is at the heart of innovation and entrepreneurship. Needless to say, 15 years goes by fast when raising two children and running a business. In 1995, expecting our second child and laid off from my position as a creative director at a Cleveland, Ohio design firm, my wife (and business partner) and I decided to form "Brian Sooy & Co." We worked out of a 154 sq ft basement home office, affectionately known as the Design Cave. In 2007, we renamed the firm Sooy+Co, and moved into a 2,500 sq ft space in the Entrepreneurship Innovation Center at Lorain County Community College. Considering that 50% of new firms survive past five years, I'm happy to be in the half that survived. Most remarkably, we're not the same type of firm that we were when we started, and that's been a key factor in our growth and longevity. We started as a design firm – offering tactical services to our clients – but now lead our clients with consulting on differentiation, positioning, branding and strategic planning (thinking) before we talk about things like logos, brochures and web sites (doing). Sooy+Co, like any campaign or client engagement, has its own objectives and goals and culture. A successful design firm needs to focus on its own culture and business structure as closely as it focuses on the client projects it is working on. In essence, Sooy+Co has been a 15-year project, with perhaps 20 years to go. We've won awards for projects we've designed and for business growth, but at 15, that just doesn't matter any more. We're considered a mature business, and we don't have to prove anything to anybody. What matters now are meaningful relationships and big picture thinking: the impact we have on our client's business objectives, our roles as thought leaders and community business leaders, developing the leadership qualities of our staff, leading our clients well. We're grateful for the clients who have shared our journey with us – for those who have followed other paths, those with whom we still consult with after 15 years, and for those who chose to work with us now. We're grateful to our strategic partners who help us help our clients to succeed. Thank you for your continued confidence in Sooy+Co!· We value our relationships with you, and are fully committed to your success. I've said it before and I'll say it again: Entrepreneurship is a way of thinking, not a way of doing. Are we as designers learning to change the way we think? Are we applying the same principles and processes (not formulas) that we advise our clients with to ourselves? Does the way we think lead to greater economic gain for our clients, and by extension to ourselves? Are we becoming more adept at what we do, by applying experience and thinking learned from previous opportunity to new opportunity? Are we thinking beyond the current state: beyond branding, beyond marketing, beyond doing? It's never too late to change the way we think. 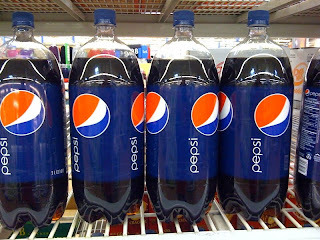 If you confuse the the new Pepsi logo and packaging with a store brand, it's understandable. It is an ambitious effort to re-brand a line of products such as this, but perhaps PepsiCo over-thought the effort. Nike has brilliantly made its symbol synonymous with its corporate name, but I don't foresee this happening with Pepsi. The company should revisit the brand and start with the typography, and hope that the consumer smiles when they say "Pepsi," instead of trying to own the smile and hoping that the consumer thinks of Pepsi when they smile. "The brand's blue and red globe trademark will become a series of "smiles," with the central white band arcing at different angles depending on the product." While the intent may have been sincere, it's poorly executed (what consumer is going to notice that each brand has a different angle?) Perhaps each bottle will soon include a legend to let the consumer know what the smile means. Perhaps the last three years of election cycle rubbed off on the brand as well, with its similarity to the Obama campaign logo. The typography: The Pepsi logo, set in lower case, alludes to vintage typography (disco anyone?) while trying to be modern. Stem and stroke weights differ, and joins bloat. This lettering was possible accomplished with a Rapid-o-graph pen, straight edge and circle template. It reflects years of amateur-looking type design in the packaging and advertising industry, and reminds me of type downloaded from a free font site. The color palette: Eeeeew. It's not friendly, it makes me wonder if I'd actually enjoying drinking what's in the bottle. It's depressing. The entire dark palette of colors on the packaging seems to infer that PepsiCo is taking itself much too seriously. The packaging: some of the comments at Under Consideration suggest that the new small bottles have similarities to, well, other objects. While the design of two-liter bottles (show here) don't change much, the wrapper combines all of the shortcomings of symbol, color and typography into a tired-looking design.